The large, walnut, wood-grain low pressure laminate top provides a roomy surface for this non-tilt overbed table by Drive Medical. The base of the product is highly adjustable; it can be raised with just the slightest upward pressure and adjusts anywhere from 28″ to 45″. 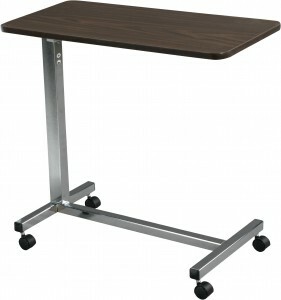 The 15″ x 30″ table top locks in place securely the moment the height adjustment handle is released. The strong, steel “H” base and mast are available in chrome or silver vein finishes. On both models, 2″ swivel casters allow for easy maneuverability.